Jheris Jordan - Burns Anderson Jury & Brenner, L.L.P. Jheris originally hails from New Orleans, but she was raised in King of Prussia, Pennsylvania. While up north Jheris attended Monmouth University, but decided to head back down south to South Texas for law school in 2012. While attending South Texas, Jheris graduated top 25% and became a certified mediator. Jheris interned for Harris County Attorney’s Office as well as mediated for the Justice of the Peace Courts and EEOC. As an animal lover she was secretary of the animal law society and a legal editor for Corporate Counsel Review. 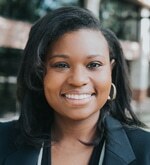 After she was admitted to the Texas Bar, Jheris joined BAJB as an associate in April 2016 primarily working in workers’ compensation.